The standoff between an Eddy County Sheriff’s Office task force and individuals wanted for questioning in the homicide of a Roswell man has resulted in an arrest. The ECSO reported late this afternoon that Michael Jimenez of Artesia, the first of two male individuals who exited a residence at 405 W. Cleveland Ave. Wednesday following a brief standoff, was officially charged Wednesday evening on an open count of murder. Jimenez is suspected in the death of 49-year-old Danny Mendes of Roswell, whose body was found early Sunday morning near the intersection of Haystack and Four Dinkus roads south of Artesia. 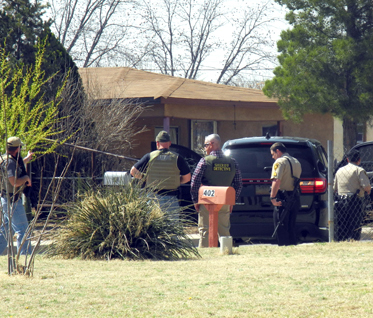 The task force and Artesia Police Department officers arrived at the Cleveland Avenue home around 11:15 a.m. Wednesday after the ECSO received a tip that persons of interest in the Mendes case were present. The standoff continued for just over three hours, with Jimenez and another, unnamed male subject exiting fairly early in the operation. Authorities remained on scene for a few more hours, as a third individual was believed to be inside. They eventually utilized a flashbang device to gain entry to the home, which was found to be empty. According to the ECSO, several interviews were conducted with witnesses and persons of interest, and multiple search warrants were approved and executed on various residences and vehicles in the days following the discovery of Mendes’ body, ultimately culminating in Jimenez’ arrest. 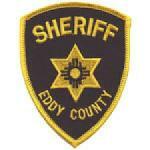 Jimenez is currently being held at the Eddy County Detention Center on a $100,000 bond.